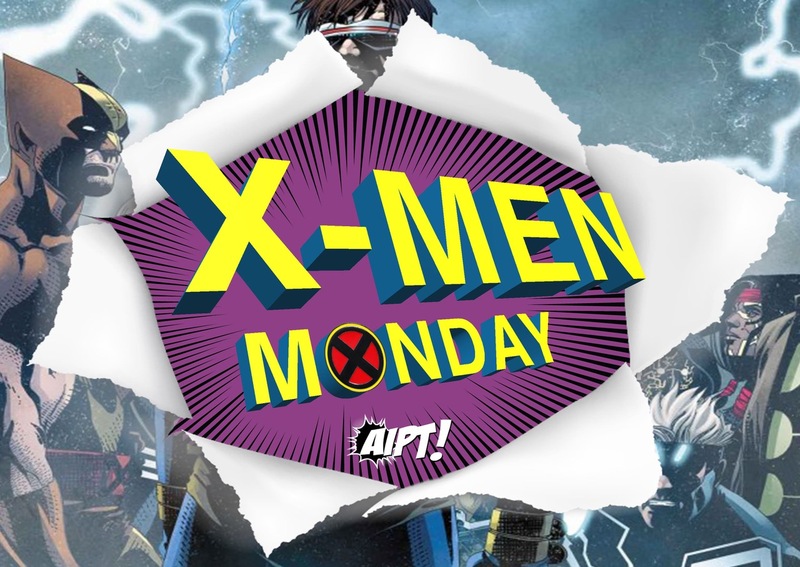 X-Men Monday (featuring Jordan D. White) #4 – Editorial decisions, Psylocke's katana and C2E2 – AiPT! Last week was pretty busy on the X-side of the Marvel Universe, with Ice Master returning and Old Man Logan taking on Neo-Hydra–not to mention all the quality time we got to spend with the kinder, gentler Apocalypse over in the Age of X-Man. This week promises to be just as hectic, with several new X-comics hitting the shelves. And, on top of all that, the Chicago Comic & Entertainment Expo (or C2E2) takes over the Windy City at the end of this week! X-Men Senior Editor Jordan D. White will talk a bit more about Marvel’s X-Men plans for C2E2 later on, as well as provide your eXclusive first look at the cover of Marvelous X-Men #5. But first, he’s got a few X-Fan questions to answer! AiPT! : This week, we have quite a few questions about the inner workings of Marvel’s X-Office, starting with Hiago Miranda (@hiagovmiranda) asking how far in advance you plan stories and series. Is the whole year already planned in terms of plots and new books, or are you able to add something new a couple months before publishing? Jordan: We do plan ahead a lot, but we are able to do things quickly if we need to. So yeah–we have got pretty solid plans for the rest of 2019 and we’re working on coming up with plans for the start of 2020, but I am sure there are things that will end up coming out in 2019 that don’t exist yet. A lot of it just has to do with practical matters–your average comic book artist takes five to six weeks to draw one issue, so for a six-issue series it’s going to take around eight months to draw, and that’s with nothing going wrong. Shorter things–one-shots, annuals, things like that–they require less lead time and therefore are much easier to add in on the fly. But yeah–I have scripts for things that come out near the end of the year that won’t even be announced for months. AiPT! : Next, Ross Hutchinson (@RPHutch1975) wanted to know if there are any golden editorial rules that you have to make sure X-writers follow. Jordan: I am not sure there are any 100% unbreakable rules. I mean, there are things I can think of that are important to be aware of, and things that are generally true, or things that are common mistakes to look out for… but for every one of them, there are writers who break them and make it work. Make a good story is the top rule, because that trumps everything else, if it’s good enough. Oh–I guess probably the closest thing to a golden rule is to turn in scripts that are formatted to be clear and readable. There is not an industry standard for comic book scripts the way there is for screenplays. I have three scripts open right now by three different writers, and the formatting is COMPLETELY different for each one. But what matters is clarity for your audience, and for a comic book script, the audience is something like one to six people: the editor, assistant editor, penciler, inker, colorist and letterer. To that end, the important thing about it, formatting-wise, is that it makes clear at a glance where page and panel breaks are and makes the dialog distinct from the panel description. As in, you should not really have to even read to see those things easily–just looking at a page without reading a single word, you can see those things. I did a sample script format a little while back to show what is probably my favorite and ideal script format. AiPT! : Cheesecakes (@2chzcakes) was curious to learn your opinion on mutants being members of non-X-teams or on multiple teams at once. Jordan: No strong opinion, really. It shouldn’t be a big deal for a mutant to be on a non-X team, right? A superhero is a superhero. It’s not what’s in their genes that makes them heroes, it’s what’s in their character. So, Berto and Sam being on the Avengers? It just means them facing some slightly different world-ending threats and saving everyone with a different logo on the book. AiPT! : Drew (@THEWHlTEQUEEN) was wondering if any mutants would have their own ongoing series soon, or at least after “Age of X-Man” wraps. Jordan: We’ve got a lot of plans for the rest of the year, but what form those plans take, it is too soon to say. Definitely keep your ears pointed towards C2E2 at the end of the week, though. AiPT! : And for our final editorial question, James Abele‏ (@greenmonk) asked if you could explain the rationale for the War of Realms: Uncanny X-Men mini-series to have Legacy numbering? How should James file these issues in long boxes with the regular ongoing? Jordan: We figured this is a good way to show that it figures into the main series, written by the same writer, and show where it takes place in that run. We couldn’t just slide the crossover issues into the main run, because it needed to take place over the course of the event, and we wanted to keep up our twice-a-month schedule. Well, now we basically get three per month during the crossover. As for where to put it in your long boxes, that’s a great question! I guess that would depend on how you reflect Legacy numbers in your long box as is. Do you file all the Uncanny X-Men series as though they are one series, or do you file them as separate series? If you file it as one series, then yeah–you’ll want to slot these three issues in between issues 15 and 16 of the current run. If you put them separately, then file this with your mini-series. For my own part, it would be filed under Marvel\X-Men\Miniseries\W. AiPT! : Alright, now for some character questions. Rogue and Gambit… meerah (@roguesugah) asked if these newlyweds would be on any team books coming up. Jordan: So, again… you see how this would be considered a spoiler, right? If I had a book planned for later this year that had them as members that has not been announced or solicited yet, then me telling you the true fact that they are members of it is a spoiler. If I revealed that, I would just have to hope the writer of that book would not be mad at me for it, especially if it’s a team they’ve never been a part of before. AiPT! : This one’s pretty bold… but I feel like Cyclops can take it. FrostSummers (@EmmaFSummers) asked if Scott still doesn’t know that Rachel was taken by Ahab. OR, does he just not care about his daughter? Jordan: Who would have told him? I don’t think anyone on his team of X-Men was around when Extermination happened. It is true that he was there as a teenager when she was turned back into a hound, but he was not there when the fight with Ahab ended and he took her with him. I would guess he assumes she was killed along with everyone else he cares about, and Logan, Havok, and the New Mutants were not there to know he is wrong. Oh, I suppose Cable could have told him. But, as we saw in X-Force last week, Cable has been trying to get Rachel back himself, so I would guess he didn’t tell Scott in order to keep Scott from coming with him to rescue her. He knew Scott had other things to focus on. AiPT! : Psylocke (@MentalMonarch) had a question about… Psylocke! We’ve seen Psylocke’s new telekinetic weapons but have yet to see the katana. Is it safe to assume that’s not part of her repertoire now that she’s back in her original body? Jordan: I don’t think she CANNOT form it, but I think it’s not her go-to anymore. I really liked her new sword and shield and would like to see her keep using them for a long time. Let’s hope they stick! AiPT! : Stephen Daily (@IamStephenDaily)‏ asked why X-23 isn’t in the same boat as Armor and the other young X-Men? Isn’t she the same age as them? AiPT! : Finally, let’s talk costumes! Marvelous Patric (@marvelouspatric)‏ had a question not just for you–but everybody–it would seem. Marvelous said, can we all officially admit the Jim Lee-era Cyclops and Jean Grey costumes are the best ones and all they should wear? I’ll answer first – No, I will not admit that. OK, your turn, Jordan. Jordan: Nah, I am not ready to admit that. They are pretty great, but so are the Morrison ones. I think my favorite Cyclops costume is actually one that’s never been shown before. And Jean was great in her Phoenix costume, as well! AiPT! : Before I let you go, Jordan, C2E2 is at the end of this week–so what kinds of reveals can X-Fans look forward to? Jordan: Pretty big ones. Ones that are going to have lasting repercussions for a long, long time. AiPT! : And for your weekly song recommendation… how about a tune that captures the feeling of those big C2E2 reveals. And with that, we bring another edition of X-Men Monday to a close. A big thanks to Jordan for stopping by and, of course, a huge thank you to all the X-Fans who submitted questions. We’ll start to collect new questions for Jordan to answer tomorrow (Tuesday, March 19) on our Twitter page–so get those questions ready and be sure to report back here next X-Men Monday! Wait, that cover–I figured it out! That’s not Beast!! !